Introduction: The Plymouth Superbird was created for the same reason as the Dodge Daytona — a full on high speed race machine designed for the NASCAR races, but available to the public. Comments: Trying to capture some of the success that their Dodge brothers had in 1969 with their Daytona, Plymouth tried the same thing in 1970 with their creation, the Plymouth Superbird. 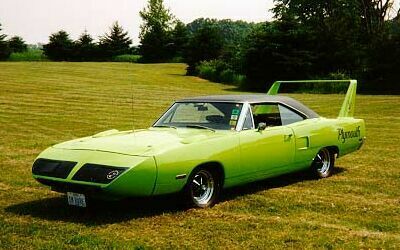 Although similar in appearance, the Superbird was actually quite different from the Daytona. The Superbird was based on the Plymouth Road Runner and the nose, airfoil, and basic sheet metal was different between the Daytona and Superbird. The special nose added 19 inches to the overall length (the Daytona’s was 18 inches), and the trunk spoiler was more angled and higher than the Daytonas. On both models, the spoiler was two feet high so that the owner could open the trunk. Although it created quite an impression on the street, the wing did almost no aerodynamic good under 90 mph. 426 V8 Hemi 425 bhp @ 5000 rpm, 490 lb-ft @ 4000 rpm. 440/390: 0-60 in 5.9 seconds, 1/4 mile in 14.26 seconds @ 103.7 mph. 426/415: 0-60 in 4.8 seconds, 1/4 mile in 13.50 seconds @ 105.0 mph.